Luxury purple knit slipper socks with gripper soles for women. Luxury purple knit slipper socks with gripper soles for women. 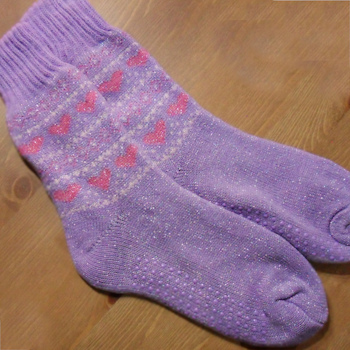 Thick and cosy lavender purple knitted slipper sox with pink hearts and stars pattern with a pretty glitter effect. Bottoms of the socks have rubber grip dots to help keep from slipping on hard floors. Luxury purple knit slipper socks with gripper soles for women. Thick and cosy lavender purple knitted slipper sox with pink hearts and stars pattern with a pretty glitter effect. Bottoms of the socks have rubber grip dots to help keep from slipping on hard floors. Keep the lady of the house warm with cosy warm feet in these lovely slipper socks. Great xmas gift! Ladies One Size Fits All.